The Mini Boston Terrier - Is This Tiny Dog A Good Pet? You are here: Home / Breeds / The Mini Boston Terrier – Is This Tiny Dog A Good Pet? Welcome to the complete guide to the mini Boston Terrier! This tiny pup is a scaled-down version of one of America’s favorite dog breeds. The looks, traits, and temperament of the full-sized Boston Terrier are shrunk into a much smaller package, making the miniature form irresistibly cute! The Boston Terrier is a compact dog who has a short sleek coat, a flat face, bat-like ears, and prominent eyes. Most weigh between 10 and 25 pounds and stand 12 to 17 inches in height. A mini Boston Terrier is likely to weigh less than 10 pounds. Over the last few years, there has been a growing trend for these so-called teacup dogs. This puts them at the center of a controversy. The AKC and other official dog associations do not recognize or approve of miniature breeds, so there are no specific regulations. 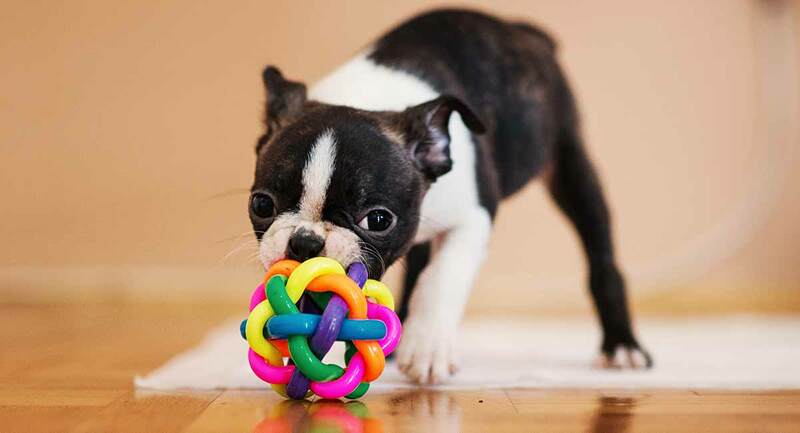 Here we look at some of the big issues surrounding these smaller-than-average dogs, with everything you need to know about the mini Boston Terrier. Everybody loves puppies, and the mini Boston Terrier remains puppy-sized even in adulthood. So it’s no wonder that they’re so appealing. It is natural for humans to find an animal with baby-like characteristics extremely cute, creating a desire to nurture and care for it. Miniature dogs are popular because they are easy to handle and look after. They need minimal living space, food, and exercise. So they’re ideal for those living in apartments or for the elderly. It also allows those unable to own a standard size Boston Terrier to have a miniature version of their favorite dog. Obviously, there is an allure to owning a tiny pup that is so small and delicate. But how does miniaturization occur? Where Do Mini Boston Terriers Come From? There are three different ways to achieve miniaturization of the Boston Terrier. Each method has potential drawbacks, along with questionable breeding practices. These methods include crossbreeding, the introduction of a dwarfism gene, and repeatedly breeding from the runts of the litter. One method is to mix a standard breed with a smaller breed, creating a hybrid designer dog. However, the problem with crossbreeding is that the outcome is unpredictable regarding appearance, size, and temperament. Puppies may inherit more traits from one parent breed than the other. They may not possess any features unique to the Boston Terrier or be small enough to be classed as a miniature. There is also the possibility of making health issues worse or creating new ones from poor breeding practices. However, when they are bred by responsible people, mixed breed dogs are often healthier. This is because mixing two different breeds, increases genetic diversity. Increased genetic diversity is linked to bigger litters, better newborn survival rates, and overall improved health – overall this is called “hybrid vigor”. Here we look at some popular breed choices mixed with the Boston Terrier. These two small breeds are very similar. Both are smart, loving dogs with flat faces, which unfortunately means they are brachycephalic. While a flat face may look cute, it compromises the breathing of a Frenchton. This is intensified by hot weather and exercise and can cause many health issues. Furthermore, both breeds have screw tail, which is linked to painful deformities of the spine. Overall, their exaggerated shape also means that both breeds struggle to give birth naturally. Combining the friendly, intelligent, and amusing Boston Terrier with the comical but loving Pug creates an entertaining and adorable mix. However, once again, both these sweet little dogs are brachycephalic. The Bugg is prone to respiratory conditions, along with eye diseases due to their prominent eyes. Like the Frenchton, the Bugg will inherit a screw tail from both of their parents, and this makes them extremely vulnerable to spinal problem. And once again, the extreme conformation breeders have pursued in Boston Terriers and Pugs means that they are likely to need a lifetime of veterinary care, and a cesarean section should they have puppies. The Bochi is a popular mix of the stout Boston Terrier with the world’s smallest dog breed, the Chihuahua. Both kinds having different but loveable traits. However, the Apple Head Chihuahua, like the Boston Terrier, is prone to Brachycephalic Airway Syndrome. So it is more desirable to crossbreed with a Deer Head Chihuahua for a healthier pup. Dental problems. These tiny dogs have the same number of teeth as bigger dogs, but much smaller jaws, which can lead to painful over-crowding and infections. Luxating patellas. Both Chihuahuas and Boston Terriers are prone to dislocating their kneecaps. Broken bones. These little pups are very fragile, so playing too roughly or even jumping down from furniture can easily result in fractures. Introducing the dwarfism gene is another method of miniaturization. Instead of shrinking the animal’s whole body, this gene produces legs that are short and stumpy, like the Corgi or Dachshund. This gives the impression that the dog is smaller, as it is lower to the ground. This genetic disorder is known as achondroplasia. It means that the dog’s bones are unable to grow to the size standard of their breed. Using this technique is not desirable as it can cause many joint and back issues, including intervertebral disc disease (IVDD). Special care is required for dogs with dwarfism to avoid overworking the joints and preventing any possible injuries. Quite often, breeders sell the runts of a litter as teacup dogs. However, it is more common to selectively breed from these little pups to create the tiniest dog possible, with each line becoming smaller and smaller. The perceived advantage of this method is that the unique traits of a breed, in this case the Boston Terrier, are retained. But it can take several generations before a miniature version of the standard breed is achieved. Runts are small and often weak. Their small size means they struggle to find a place among their bigger siblings when it’s time to feed from mum. This means they grow slowly, and they miss out of vital antibodies for setting up their immune system. So they usually suffer from various health problems, making it difficult to produce healthy puppies. We’ve written more about the pitfalls of miniaturizing dog this way right here. This dog is a brachycephalic breed, so it is prone to various chronic breathing and health problems. Care is required when exercising the mini Boston. Walks should be kept short, especially during hot weather. It is also essential that your home has air conditioning, as this type of dog needs to stay cool or risk overheating, which is extremely dangerous. There are more than twenty eye problems associated with the Boston Terrier. These include corneal ulcers, cataracts, and glaucoma. This breed is also susceptible to patellar luxation and various skin problems. As a potential owner, you need to be aware that a mini Boston Terrier is under the normal weight range of the standard dog. So there’s a danger of other conditions as well, such as fragile bones, congenital defects, and organ failure. Also, these miniature dogs are so small they risk serious injury from being trodden on or dropped. They have low sugar levels so might have a seizure or even die if they miss just one meal. Although a full-sized Boston Terrier’s lifespan is between 13 to 15 years, the mini version is likely to be much less. Many breeders of teacup puppies charge exorbitant prices, so you can expect to pay anything from $500 up. This is why there are so many unethical breeding practices. If you decide you still want to go ahead and buy a mini Boston Terrier, make sure you visit a reputable breeder at their premises. You should meet both parents. A good breeder will answer your questions and address any issues regarding these tiny dogs. They should provide the necessary tests for genetic health conditions. They should also offer an agreement which includes a health guarantee. Many miniature dogs end up in shelters due to the issues mentioned, so you may decide to use this option with the added advantage of receiving full support from the rescue center. Is a Miniature Boston Terrier Right For Me? We can’t pretend not to see the appeal of a mini Boston Terrier. These pocket-sized dogs pack all the loving companionship of a full-sized Boston Terrier into a smaller, easier to accomodate package. However, just like their full-sized cousins, we cannot recommend these little dogs as a pet for any home. The Boston Terriers’ distinctive appearance has been pursued ruthlessly at the expense of their quality of life. These dog’s flat faces and screw tails cost them their health and comfort. And sadly, none of the ways to miniaturize a Boston Terrier also fix these problems. The smaller breeds they can be crossed with usually have the same problems, and deliberately introducing dwarfism is unethical. As is repeatedly breeding from runts without regard to dogs’ health. Mini Boston Terriers are not good pets, but that doesn’t mean you can’t have a loyal canine companion under 10lbs. Do you own a mini Boston Terrier?